Kabir News Tech Could Smartwatches End Up Next To Smartphones? Could Smartwatches End Up Next To Smartphones? Since the Pebble watch succeeded in raising funds to get off the starting block and become a reality in May 2012, there has been some interest re-sparked in the idea of a smartwatch. The Palo Alto, CA-based Pebble Technology managed to go beyond achieving its goal of $100,000 in a little over a month with almost 69,000 backers throwing $10.2 million into the hat to get this thing started. That gives Pebble enough to cover the physical build of the phone, manufacturing them, and—if managed well—releasing another version of the smartphone in a few years’ time. This isn’t the first time the smartphone dived onto the tech scene or even the first time the idea has been considered. Sometimes science fiction programs can spark the idea of where technology could go and even should go. Just think of all the stuff we should’ve had in 2000 based on shows from the 1960s and 1970s. Of course sci-fi tends to get into the far out parts of science advancement that would make the public really take notice such as human piloted planetary travel, planet colonization, and time travel, but one thing that is a common thing in science fiction is wrist-based technology and communication. There are actually wristwatch phones on the market already and they’ve dropped significantly from the prices they were originally. As indicated by the fact not many can be seen the watchphone—most of which are unlocked—never took off despite having the basic features of mobile phones as well such as calling, text message, video, basic web, and music. Some even come with apps that allow messaging, games, and so on. Of course one of the reasons it probably did take off like it should’ve was the display. While a watch display can be made bigger if it needs to be more practical, too big would defeat the purpose of blending tech together while keeping the selling point of being watch-sized. The idea of having a smartphone on your wrist gives it a practical edge: hard to lose, in some cases harder to break by methods that most smartphones break such as being sat on or dropped, most are water-proof; it’s a very win-win piece of technology until you realize you’ll probably need a stylus to navigate it. That is unless you have one the pricier voice activated watchphones. As it stands, the smartphone—and even the standard mobile phone—have replaced the watch as a method of telling time. The watch has only one function and does it perfectly depending on how you set it or how you prefer for it to be set. A smartphone allows for so many things to be done in one location that the watch has been regulated to fashion accessory or a symbol of status and even then the smartphone could easy into that role as they become more customizable. Samsung explored the smartwatch idea not too long ago. Unlike a watchphone, the smartwatch allows for apps to be added to fit the needs of the user whereas a watchphone has the essentials of mobile phone already installed and typically don’t allow for more to be added unless it’s a higher end one. The Samsung S9910 from 2009 never took off due to a high price and little flexibility despite being pretty stylish. The Pebble watch’s success in raising $10 million has bigger name companies taking a second look at the technology. 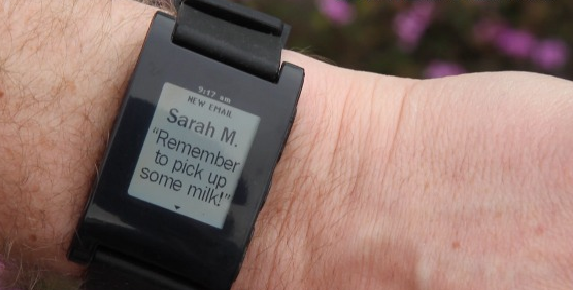 The Pebble phone allows for the wearer to do several pretty basic functions. It connects via Bluetooth to the wearer’s smartphone and can alert him or her of incoming calls and allow them to view texts and emails without going to their phone—saving the wearer a two to six trip into a pocket or rummaging through a purse. It also allows for the wearer to add apps without using a computer. The apps don’t really have a practical use although some like pedometer can be useful. Outside of that one, you’ll mainly look for recreational apps. Currently Apple, LG, and Google are looking into smartwatch technology while Microsoft could end up revisiting the SPOT watch—which didn’t take off mostly due to a $800 launch among other things—from 2004 and saw it’s end four years later. They probably wouldn’t call it the SPOT watch, but the potential to dive back in if the smartwatch becomes an actual thing and ends up being profitable is there. Pebble’s success shows that it could become an actual thing, but then again the watchphone could’ve been a thing and it allowed for a bit more. What the smartphone at this stage allows for is that safe spot between being onto technology and “geekdom.” The line is very thin with talking into your watch nudging the wearer into the “geekdom” territory. If the technology titans go through with their smartwatch plans, wearers could end up talking into their watches anyway. What do you think of Pebble’s smartwatch or the potential for smartwatches from Samsung, LG, Google, and Microsoft to name a few? Do you see them taking the idea even further or keeping it safe to test the waters for themselves?